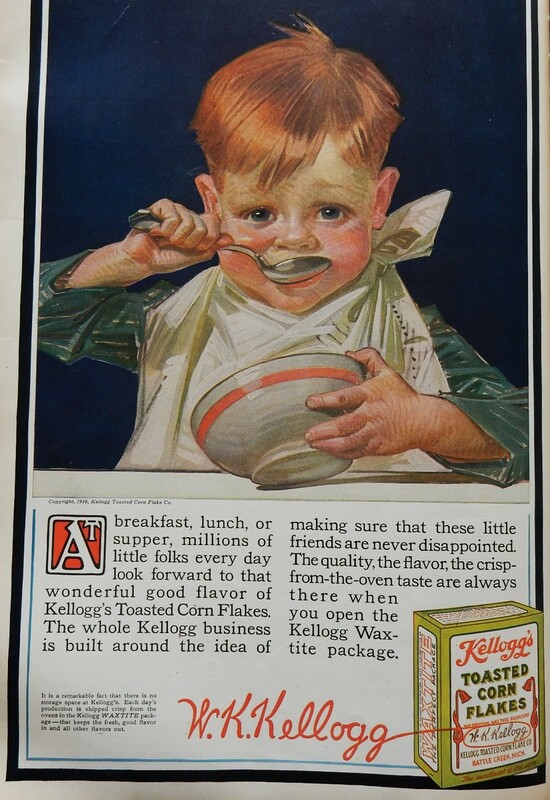 When I saw this adorable ad for Kellogg’s Corn Flakes I couldn’t quite decide whether I should smile, or feel a twinge of sadness that processed breakfast foods were around a hundred years ago. I wonder how the nutritional quality compares to today’s cereal. Perhaps there was less sugar a hundred years ago. The cereal probably wasn’t fortified with vitamins back then. I don’t know about the sugar. I grew up with corn flakes, raisin bran, Cream of Wheat, and the various Chex cereals. Today, my dry cereal of choice is GrapeNuts. The truth of the matter is, there’s nothing wrong with a bowl of those with a banana or strawberries. Where we went wrong with cereal was taking the path lined with Cocoa Puffs, Sugar Pops, and Froot Loops. Good grief. Even thinking about those makes me a bit queasy!
. . . and, Capt’n Crunch, and Lucky Charms and Apple Jacks and . . . whew, the list of sugary cereals goes on and on. What an adorable little boy in that advertisement. I wonder if he was based on a real boy and what became of his life. And did he really enjoy the cornflakes. I love cornflakes. I’m like you on the mixed feelings. He looks so real. I bet he really existed . . . maybe the artist’s child, nephew, or neighbor. Thanks for your fun and interesting blog. I enjoyed making the recipe and thinking about it being from history makes it all the more special. I’m also going to add a comment on my Apple Johnny Cake post that tells readers about it. What a cute little boy. A Mikey from the past? Cereal now is all fortified, so there’s probably a lot more vitamins in it now. A weary cook likely appreciated the ease of getting breakfast on the table. Kellogg’s corn flakes, my first processed cereal, still eat them. Good point. The women back then worked so hard putting meals on the table day in and day out – and they probably really appreciated the availability of corn flakes. I sure wished he was on the box when I was growing up,and had to eat cornflakes. He’s adorable. I’m trying to remember what was on the corn flake boxes back when we were kids. Was it the rooster? sigh. . . I’m probably just as happy not knowing the details, but I must admit that it sounds like a really interesting book. Yuck! It sounds awful. At least they don’t put ammonia in meat any more. I can see why his tidbits are stressful. My husband still mixes his Kellogg Corn flakes in with other higher fiber cereals and sprinkles cranberries, dried and blueberries on top with Almond milk. What a combination that tastes delicious!! Mixing the old with the new. It’s good to mix the old and new. Corn Flakes would be delicious with dried cranberries and blueberries. It is really surprising to think that processed cereal is over 100 years old. I grew up near Kellogg and never knew how old of a company they were. It’s a cute advertisement tho! The Kellogg’s Company has an interesting history. According to Wikipedia, Corn Flakes were invented by a Dr. Kellogg and his brother at the Battle Creek Sanitarium. The Sanitarium was a health resort, and Corn Flakes were a health food that was served to the patients. I share your feelings. Cute picture! Interesting how the ad highlights the packaging. . . I wonder if Wax-tite is the same thing as waxed paper. I am going to guess it is… or whatever they use to seal up cereal now? That little boy is cute as a button, but he’s lots older than I am!!!! It’s strange how we can almost step into a time machine when we look at pictures from a hundred years ago. Back when I first started this blog, I used to post the diary entries of my grandmother a hundred years to the day after she wrote them. My grandmother was a teen-ager at the time – and when she wrote about silly things she did, I had an urge to give her advice from my perspective as the mother of grown children. Then I’d realize that the events she wrote about took place a hundred years ago–and that our roles had somehow become reversed through the lens of time. That little boy is so adorable! Sometimes I think we worry too much. My mom lived to be 94! I agree! I also had some ancestors who lived to be quite old. Now that you mention it, I can remember listening to the “snap, crackle and pop” too when I was a child. Thanks for jogging a memory. That ad is so cute that it almost deserves to be framed and hung on a wall! My mother bought corn flakes. My aunt bought Wheaties. I always enjoyed breakfast at my cousins so I had a chance to eat Wheaties. Mostly we ate hot cereals though. This was in the 1950s so they had been around a long time. I bet they were so much better back then! I never had cornflakes for breakfast so I can’t relate. A lovely add though!